Marcus Johansson scored two goals as the division-leading Washington Capitals, and newly-acquired defenseman Kevin Shattenkirk, topped the injury-depleted Rangers, 4-1, Tuesday night at The Garden. The Blueshirts squandered a 1-0 1st period lead, and have now lost two straight games, but finished February with a 9-3-1 record. Shattenkirk, acquired from St. Louis Monday, played nearly 18 minutes for Washington, but without scoring. The Rangers were without Dan Girardi, Kevin Klein, and Mika Zibanejad, all out with injuries. The Blueshirts took that 1-0 lead 5:08 into the game when Brady Skjei deflected a pass from Adam Clendening past Washington goalie Braden Holtby. 2nd period goals from Johansson [at 7:28] and Brett Connolly [at 16:26] gave the Caps the lead. Washington added 3rd period goals from Johansson and Nicklas Backstrom for the final 4-1 margin. Holtby made 29 saves, while Henrik Lundqvist made 34. The struggling New York power play continues to sputter, going 0-for-4; it is now 1-for-29 in the last 11 games. The Rangers [now 40-21-2, 82 pts] play the Bruins in Boston Thursday night. 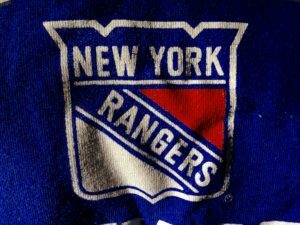 After stirring wins Thursday and Saturday, the Rangers came back down to Earth Sunday afternoon at The Garden, playing an uninspiring game and losing to the Columbus Blue Jackets, 5-2. The loss dropped the Blueshirts to 4th place in the Metropolitan Division standings, just behind Columbus. The Blue Jackets got two goals from Alexander Wennberg and two from Cam Atkinson; Atkinson now has 29 on the season and is tied for 5th in the NHL. Josh Anderson scored the final Columbus goal, with 0:36 to play. Rick Nash [4:07 into the 1st period] and Jesper Fast [with 3/10ths of second left] scored the New York goals. Sergei Bobrovsky made 28 saves in the win. Henrik Lundqvist stopped 21 of 26 shots; he is now 7-2-1 in his last 10 starts. The Rangers [now 40-20-2, 82 pts] host the Washington Capitals Tuesday night at The Garden. Mika Zibanejad‘s goal 1:16 into overtime gave the Rangers a 4-3 win over the New Jersey Devils Saturday afternoon in Newark. The Blueshirts are now 9-1-1 in their last 11 games. For Zibanejad, it was his first goal in 16 games. Kyle Palmieri scored twice in the first 74 seconds of the 3rd period to give the Devils a 3-2 lead. That scored remained until Adam Clendening scored with 4:25 to play to tie the game, 3-3. Antti Raanta stopped Palmieri on a breakaway in the overtime. Seconds later, Brady Skjei passed up-ice to Zibanejad, who beat Cory Schneider for the game-winning goal. Raanta finished with 35 saves, while Schneider had 36. Chris Kreider and Oscar Lindberg had the other New York goals, both n the 1st period. 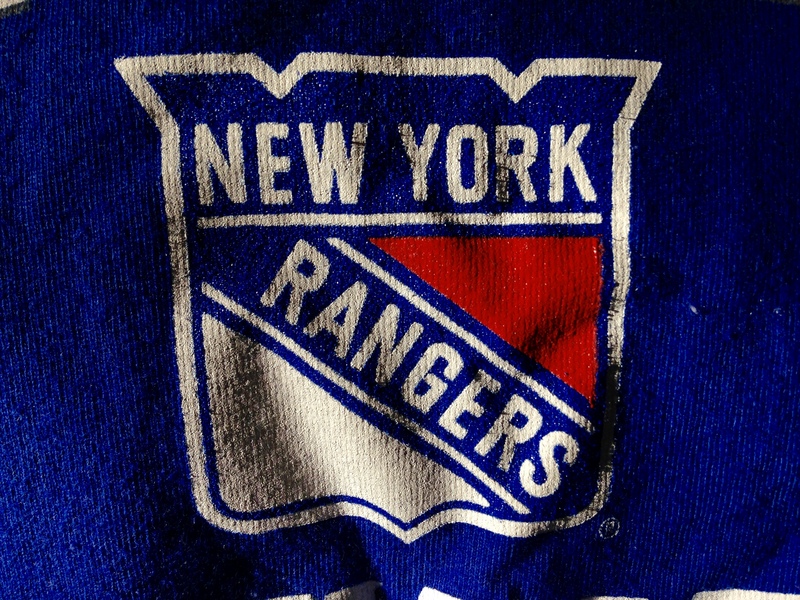 The Rangers [now 40-19-2, 82 pts] host the Columbus Blue Jackets Sunday afternoon at The Garden. 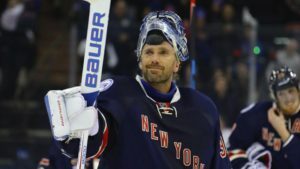 In a heart-stopping hockey game Thursday night in Toronto, Henrik Lundqvist made save after save, and the Rangers edged the Maple Leafs in a shootout, 2-1, in a well-played, edge-of-your-seat battle, featuring a goalie duel between Lundqvist and Toronto’s Frederik Andersen. Mats Zuccarello and Mika Zibanejad scored in the shootout for the Blueshirts. Lundqvist stopped Nazam Kadri to end the game. Connor Brown got Toronto on the board midway through the 1st period, scoring his 15th of the season at 10:56 to make it 1-0. Neither team scored in the 2nd period, and in the 3rd, J.T. Miller scored the equalizer, beating Andersen with 9:10 to play to make it 1-1. Seconds after a New York power play ended, Miller put the rebound of a Kevin Hayes shot in for his 19th of the season. Words will not do the final minutes of regulation or the overtime justice. Morgan Rielly hit the post with 1:43 to play, and Lundqvist stopped Auston Matthews and James van Riemsdyk. The 3-on-3 overtime was just great end-to-end action. Andersen stopped Miller, Michael Grabner and Rick Nash, while Lundqvist stopped Leo Komarov and Matthews on breakaways. Lundqvist finished with 32 saves while Andersen made 37. The Rangers [now 39-19-2, 80 pts] play the Devils Saturday afternoon in New Jersey. Carey Price and Henrik Lundqvist hooked up in an old-fashioned goalie’s duel, and when it was all said and done, the Montreal Canadiens beat the Rangers in a shootout, 3-2, Tuesday night at The Garden. Paul Byron scored past Lundqvist in the 5th round of the shootout to give Montreal the win. The win was the first for Claude Julien since taking over as Monteal’s head coach last week. Andrew Shaw [3:55 into the 1st period] and Shea Weber [a power play goal 1:42 into the 2nd] scored in regulation for the Canadiens, while Oscar Lindberg [at 10:03 of the 1st] and Rick Nash [at 9:26 of the 2nd] scored goals for New York. Neither team scored in the 3rd period, and five minutes of 3-on-3 overtime could not settle things, though Price robbed J.T. Miller with :04 to go. In the shootout, Mats Zuccarello scored for the Blueshirts in the 1st round. Alexander Radulov scored for Montreal in the 2nd round. Neither team scored again until Byron’s game-winner. Mika Zibanejad, Derek Stepan, Jimmy Vesey, and Miller could not beat Price in the overtime. Price finished the game with 28 saves. Lundqvist had 26. The slumping Rangers power play was 0-for-4 on the night, and is now 1-for-20 in the team’s last seven games. The Rangers [now 38-19-2, 78 pts] travel to Toronto to play the Maple Leafs Thursday night. Mats Zuccarello scored midway through the 3rd period to give the Rangers the lead, and Henrik Lundqvist and the New York defense made it stand up, as the Blueshirts edged the division-leading Washington Capitals, 2-1, Sunday afternoon at The Garden. The win was a bit of a statement by the Rangers to the Capitals, the team with the NHL’s best record. The Blueshirts are now 2-0 against Washington this season, with two meetings still to come. The Capitals, who lost Saturday in Detroit, have now lost back-to-back games for the first time since December 27-29. Lundqvist was rock-solid throughout, making 31 saves, including two point-blank saves on Marcus Johansson in the game’s final minute. Ryan McDonagh gave the Rangers a 1-0 lead 7:49 into the game, taking a rebound in front of the Washington net and scoring past Washington backup goalie Philipp Grubauer. The Rangers though they had made it 2-0 on a goal by Mika Zibanejad with 3:15 to go in the 1st, but the Capitals claimed the Blueshirts had been offsides. The replay review supported the Caps, the goal came off the board, and it remained a 1-0 game. The Blueshirts had 19 shots on goal in the period. Alexander Ovechkin tied the game with a power play goal at 17:24 of the 2nd period. Ovechkin, wide-open to the left of the net, took a pass from Lars Eller, and beat Lundqvist for his 27th goal of the season. Then, midway through the 3rd, Zuccarello took a pass from Chris Kreider behind the net and scored the go-ahead goal at the 8:37 mark of the period. McDonagh blocked 5 shots. Dan Girardi blocked 4. The Rangers [now 38-19-1, 77 pts] host the Montreal Canadiens Tuesday night at The Garden. The Rangers came into Thursday night’s game with the Islanders having the most road wins in the NHL this season, but the Blueshirts could not overcome a sloppy 2nd period, and lost to the Islanders in Brooklyn, 4-2, snapping their six-game winning streak. Andrew Ladd scored two goals for the Islanders, and John Tavares added two assists. Nick Holden and Jimmy Vesey scored goals for the Rangers. Holden’s goal 6:23 into the game, off a nice pass from Mats Zuccarello, gave the Rangers a 1-0 lead. But Anders Lee and Ladd scored in the 2nd period to give the Islanders a 2-1 lead after 40 minutes. In the 3rd, a short-handed goal from Nikolay Kulemin at 3:03 gave the Islanders a 3-1 advantage. Vesey’s power play goal 43 seconds later cut it to 3-2, but the Blueshirts would get no closer. Vesey’s goal snapped on 0-for-13 drought for the Rangers’ power play units. Ladd added an empty-net goal with 1:10 to play for the final 4-2 margin. Henrik Lundqvist stopped 19 of the 22 shots he faced. The Rangers managed only 27 shots on goal, and now have gone five straight games with 30 or fewer shots. The Rangers [now 37-19-1, 75 pts] host the Washington Capitals Sunday afternoon at The Garden. The Rangers got 3rd period goals from Kevin Hayes and Jimmy Vesey, and Antti Raanta made 30 saves, as the Blueshirts beat the Blue Jackets, 3-2, Monday night in Columbus. It was New York’s 6th-straight win, their longest win streak of the season. It also moved them into a mathematical 2nd-place tie with the Blue Jackets and Penguins with 75 points, though those two teams have played fewer games than the Rangers. Columbus opened the scoring at the 8:12 mark of the 1st period when Brandon Dubinsky scored his 8th goal of the season to make it 1-0. The Rangers tied the score just 12 seconds into the 2nd period, while trying to kill off a penalty. Dan Girardi’s slapshot beat Sergei Bobrovsky for a short-handed goal that made it 1-1. In the 3rd period, the Rangers took their first lead of the night when Hayes stole the puck, skated in, and beat Bobrovsky to make it 2-1 at 4:49. Nick Foligno tied the game at the 11:53 mark when his shot deflected off J.T. Miller‘s skate and past Raanta to make it 2-2. That set the stage for Vesey’s game-winning goal, 95 seconds later. His shot, from a near-impossible angle, off an assist from Derek Stepan, snuck past Bobrovsky and in, to make it 3-2. The Rangers [now 37-18-1, 75 pts] play the Islanders in Brooklyn Thursday night. The King has won his 400th. The Rangers got 3rd period goals from Kevin Klein, Rick Nash, and Kevin Hayes to spark a come-from-behind win over the Colorado Avalanche, 4-2, as Henrik Lundqvist won his 400th career NHL game. Lundqvist made 32 saves, including 17 in the 3rd period, and is the 12th goalie in NHL history to record 400 career wins. He is now 8-1-0 in his last nine starts. Klein – who scored two goals on the night – got the Blueshirts on the board first, with a goal 2:26 into the 1st period. He blasted a shot from just inside the blue line and Colorado goalie Calvin Pickard got a piece of it, but it dribbled in for a goal. The Avalanche tied it in the closing seconds of the 1st period on a goal from Gabriel Landeskog at 19:44 that made it 1-1. Colorado then took a 2-1 lead early in the 2nd, when John Mitchell scored just 3:01 in. The Blueshirts were near-lifeless in the period, generating little offense and squandering two power play opportunities. If the 2nd period was a spiritless one for the Rangers, they made up for it in the 3rd. Klein scored his 2nd goal of the game with a blistering slapshot at 2:50 to make it 2-2. Then Nash scored the go-ahead goal at 5:36, deflecting a pass from Derek Stepan past Pickard for his 16th goal of the season to make it 3-2. Hayes scored an empty-net goal with 1:38 to play for the final 4-2 margin. The Rangers [now 36-18-1, 73 pts] have won five straight, tied for their longest win streak of the season. They play the Blue Jackets in Columbus Monday night. The Rangers got three goals from the J.T. Miller-Kevin Hayes-Michael Grabner line and rallied from a 2-0 deficit to beat the Nashville Predators, 4-3, Thursday night at The Garden. Henrik Lundqvist continued his strong play of late, making 34 saves, and is now 7-1-0 in his last eight starts. It was his 399th win as a Rangers goalie. Cody McLeod and Calle Jarnkrok staked the Predators to a 2-0 lead in the first 24 minutes of action before the Rangers’ offense began to chip away. Grabner scored his 26th of the season at 8:12 of the 2nd, off a great pas from Hayes, to make it 2-1. The Miller tied the game 2-2 at 14:58, again off an assist from Hayes. In the 3rd period, Chris Kreider gave New York a 3-2 lead at 5:36, deflecting a pass from Mats Zuccarello past Nashville goalie Juuse Saros. It was Kreider’s 22nd goal of the season, a new career high. Miller’s 2nd goal of the game, at the 16:00 mark of the 3rd, made it 4-2 Rangers. Roman Josi‘s power play goal with 2:01 to play made it 4-3, but Lundqvist and the Blueshirts held on. Hayes finished the night with three assists. The Rangers [now 35-18-1, 71 pts] host the Colorado Avalanche Saturday night at The Garden.